I can’t express strongly enough how important it is not to be married to your menu. If, for example, I go to the store and chicken is outrageously expensive but ground beef or pork tenderloin is on sale, then I will roll with it. I’ll modify my menu and base it around the items I can get at a good price. Meat and produce are the times that have the most fluctuation, so always be prepared to improvise. The meal you cook today can help you build your stockpile. 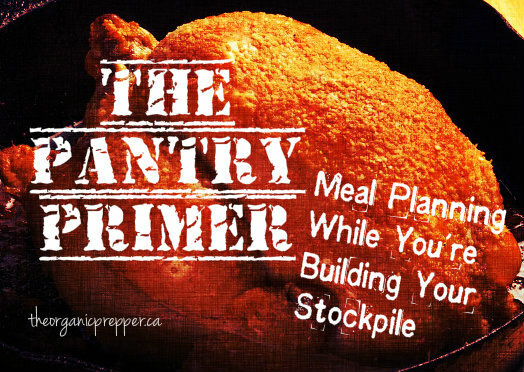 When meal planning during the building phase, your meals should either be simple and inexpensive, or they should contribute to the creation of the stockpile. 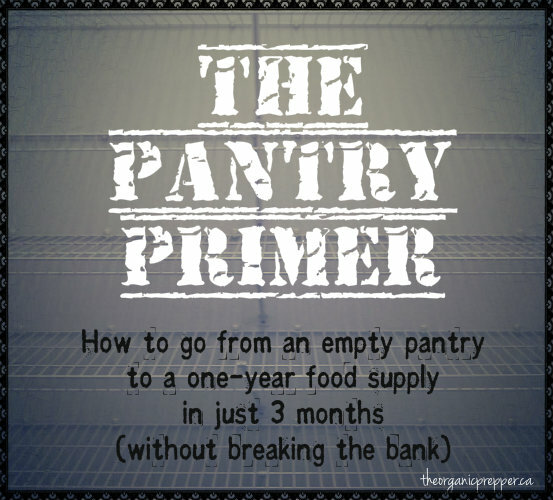 Sometimes the meal you cook today can actually help you in building your stockpile. Take a whole chicken, for example. If whole chickens are on sale, it can be an amazing investment for your stockpile. You can get a lot of mileage out of a chicken if you practice some black-belt frugality. Turkeys are even better, and when they go on sale around the holidays, I buy at least two if I can afford it. First, enjoy a roasted chicken. Throw in some inexpensive veggies like potatoes and carrots, or cook a big pot of rice or couscous to go on the side. This is a nice Sunday dinner that, depending on the size of your family, may leave you some leftovers for one more meal. Second, try a meal that is light on the meat for using up the rest of the meat. I generally make a casserole or pasta dish to use the rest of the “better” leftover chicken. Right now, it is just the two of us, so we can get enough chicken for sandwiches before the casserole. Then, make broth for canning. Simply pop the carcass into the crockpot with a head of garlic and a couple of onions. Cover it with water and simmer it overnight (8-12 hours). You can add some herbs to the pot also – but not sage. (I learned this the hard way – when canned, the flavor of sage turns very bitter.) Follow these instructions for canning turkey broth or if you have some extra meat, these instructions for “Chicken Needs Noodles” soup. You absolutely positively MUST have a pressure canner to safely preserve your homemade broth – no exceptions! Another meal that will add to your stockpile is homemade soups or chilis. This will provide you with “right now” food and “later” food – and both will be a wonderful home-cooked meal. Make a great big pot of whatever soup you fancy, leave some out to eat right now, and pressure can the rest. Here are instructions for two kinds of chili, split pea soup, beef and cabbage soup, southwestern chicken soup, autumn vegetable stew, or, you can forget the recipes and learn how to can your own recipes. I am taking a look at my favorite recipes and searching for the ones with the least number of ingredients. This is another good way to cook from scratch while building your stockpile. 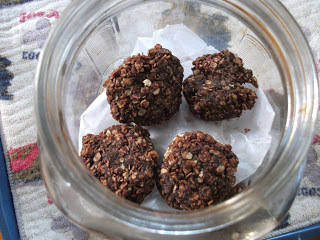 Haystack cookies, for example, are a quick no-bake treat that will only require the addition of cocoa and vanilla to my shopping list, because I already have oatmeal, peanut butter, and sugar. Also, I have no qualms about making these relatively healthy cookies breakfast when served with a glass of milk. In a sauce pan, stir together all of the ingredients except for the peanut butter and the oatmeal. Heat until these ingredients are combined then add peanut butter, stirring constantly until boiling gently. Boil for one minute, stirring intermittently. Remove from heat and pour into a bowl containing the oatmeal. 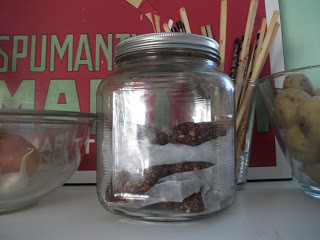 Stir to combine, working quickly before the mixture can solidify. Make the cookies by placing large spoonfuls of the mixture onto the paper-lined baking sheet. Press them down gently with the back of the spoon. Place the cookie sheet in the refrigerator overnight, uncovered, to allow cookies to become solid. Store in an airtight container in cool conditions – keep them in the fridge if the weather is warm. Reuse the waxed paper by placing it in between the layers of cookies. Other recipes with few ingredients are potato soup, a pot of beans and rice, tomato soup, or a crockpot roast with potatoes and carrots. 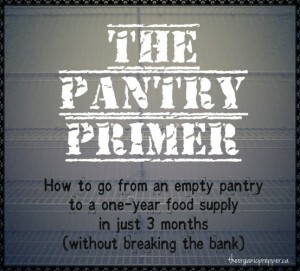 Think simple when you are building your stockpile and save the fancy stuff for later when you are well-supplied. 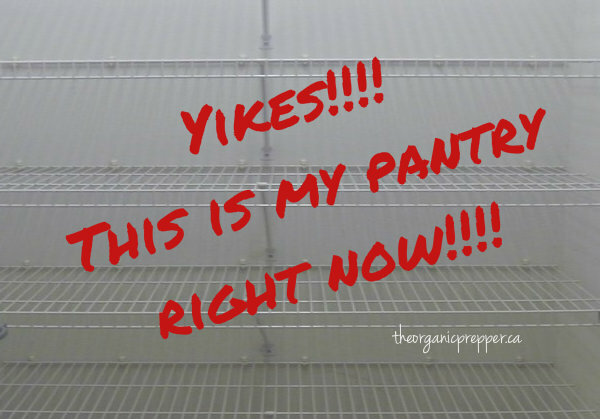 If you have to constantly run to the store every day for extra ingredients, you are defeating your purpose. You’re spending extra money on gas, you are spending valuable time, and it’s hard to keep your budget under control when you are constantly adding $5 here and $5 there. Dear Readers: Thank you so much for the enthusiasm you have shown regarding this series! I was so happy about the reception that the introduction recieved. I will do my best to get to all of your questions over the course of these articles.